From electrically-charged moons to hexagonal polar storms, this place has it all. 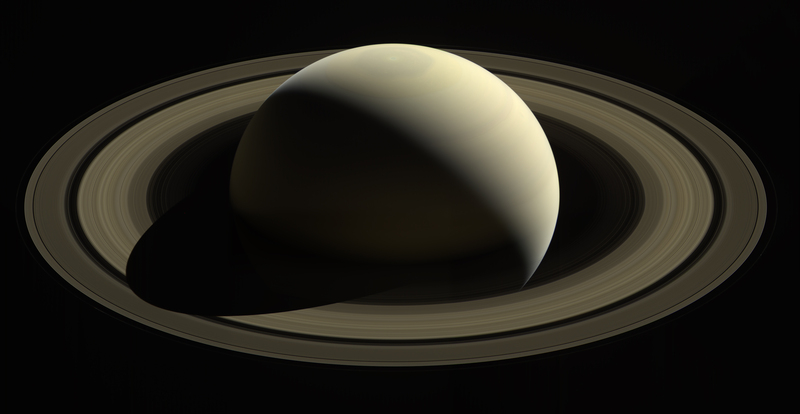 Saturn is something of a solar system unto itself (minus the requisite sun). It's surrounded by 53 confirmed moons and another 9 "moonlets," tiny worlds that are among the most exotic and diverse we've seen in this neck of the galaxy. For as much as we could see from our Earth-based telescopes, it was only by getting up close and personal with the system's second largest planet -- by sending a $3.4 billion science machine hurtling 8.88 million miles across interplanetary space -- that we were able to truly observe Saturn. And it's a good thing we did because the scientific discoveries have been near-constant in the 11 years since Cassini left home. We've seen the surface of Titan and watched its liquid methane flow, fall like rain into massive hydrocarbon seas. We saw the tiny icy moon of Enceladus reveal its 101 geysers which shoot hundreds of pounds of water ice and molecular hydrogen into space from a subsurface ocean. Think of the life we'll find in there! And above all, the Cassini mission helped us better understand the atmosphere and global mechanisms of Saturn itself. Here are nine of the most exciting scientific discoveries the Cassini mission brought about.